Beadweaving will always be my first love, but in the past year I've had fun branching out into other mediums, from wire to metal to resin. The more techniques, the more creative possibilities, right? When I learned this week that Cindy Wimmer has written a book on wire links, I couldn't wait for the print version and clicked over to Interweave to download the eBook. Everything about this book is gorgeous! 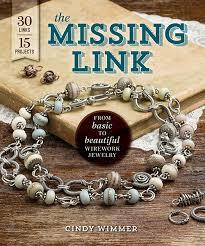 The first section features 15 links, all fun and fresh components I can't wait to include in my designs. The photography is breathtaking. Great step-by-step photos that had this novice wireworker turning out links in no time. They're followed by a section of inspiration from your favorite designers, using one or more links in their designs. The wire links are listed by degree of difficulty, so I started with my favorite in the Easy category, the Engagement Ring link. 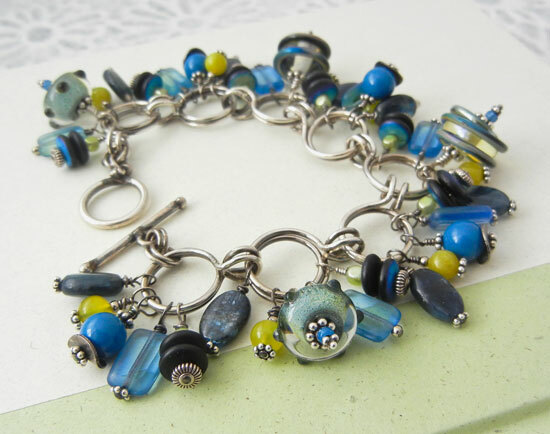 The Projects section includes a bracelet of these links by Lori Anderson that I loved and wanted to try. I worked up a set of 8 in copper wire before allowing myself to cut the first length of sterling silver. I also stirred up my first batch of liver of sulfur - lots of firsts in this project! Swarovski pearls and lampwork beads by Atlanta artist Kimberly Branch. And those practice links in copper? I connected them up, added a focal clasp and a couple of charms. I love them just as they are! You can pre-order Cindy's book from her website, or if you're as impatient as I was, you can download the eBook direct from Interweave. You're going to want this book in your library! Oh I have been wanting this book....going to have to get it now. Those links look amazing. Beautiful bracelet. 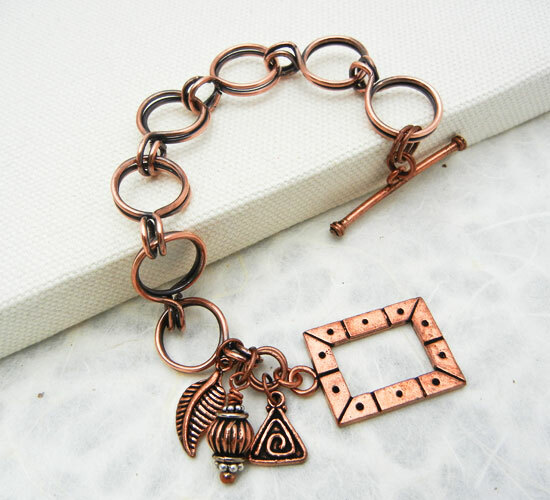 I'm fascinated by the square toggle in the copper bracelet! Both bracelets are lovely - good job! You did well on both bracelets. I have been seriously thinking about getting this book and every review I read makes me want it more. I too am just as excited about Cindy's book-it looks fantastic! I absolutely love the bracelets that you created, they are really stunning. I am (anxiously) waiting for the print version so that I can add it to my resource library. Cool projects. Gotta get that book. I stopped by for your blog hop reveal, but was happy to see what you'd made with the wire work. I bought the e-book a week ago, can't wait to try some of the links!